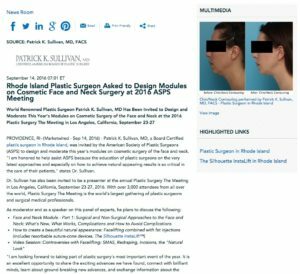 Rhode Island Plastic Surgeon Asked to Design Modules on Cosmetic Face and Neck Surgery at 2016 ASPS Meeting - Patrick Sullivan, M.D. World Renowned Plastic Surgeon Patrick K. Sullivan, MD has been invited to design and moderate this year’s modules on cosmetic surgery of the face and neck at the 2016 Plastic Surgery The Meeting in Los Angeles, California, September 23-27. Providence, RI – Patrick K. Sullivan, MD, a Board Certified plastic surgeon in Rhode Island, was invited by the American Society of Plastic Surgeons (ASPS) to design and moderate this year’s modules on cosmetic surgery of the face and neck. “I am honored to help assist ASPS because the education of plastic surgeons on the very latest approaches and especially on how to achieve natural appearing results is so critical in the care of their patients,” states Dr. Sullivan. Dr. Sullivan has also been invited to be a presenter at the annual Plastic Surgery The Meeting in Los Angeles, California, September 23-27, 2016. With over 3,000 attendees from all over the world, Plastic Surgery The Meeting is the world’s largest gathering of plastic surgeons and surgical medical professionals. “I am looking forward to taking part of plastic surgery’s most important event of the year. It is an excellent opportunity to share the exciting advances we have found, connect with brilliant minds, learn about ground-breaking new advances, and exchange information about the wonderful world of plastic surgery,” states Dr. Sullivan. Dr. Sullivan is division chief of cosmetic surgery at Brown University’s School of Medicine in Providence, Rhode Island. He specializes in cosmetic surgery of the face, neck, eyelids, breasts, and body. He is double Board Certified by the American Board of Plastic Surgery in Plastic and Reconstructive Surgery as well as by the American Board of Otolaryngology in Head and Neck Surgery. Dr. Sullivan is available for interviews upon request. For more information, visit drsullivan.com.